Not sure if of much comfort (straw clutching even) but note CA not specifically included in list of benefits falls in benefit fraud policy remit?! Says list is not exhaustive but seems pretty surprising omission given some of other benefits included? Government figures are pretty difficult to pindown ... apart from DWP data to the end of 2017. I suspect CA to be a smaller percentage in relation to the more obvious ones ... housing benefit and income support ... change of circumstances probably being the main cause as opposed to out and out fraud ... the classic being working for cash in hand and still claiming benefits. Cohabition was always a good marker in the past ... claiming benefits and then entering into a relationship ... and not reporting said change. Still , speculation at best ... until more information is published. A fortnight on and ... still no reports anywhere from " Victims " of this purge. Whistling in the wind , ideal time for the Advice Team to report some findings from the " Tens / hundreds " expected to seek their guidance ? After all , it would be " Nice " to know what exactly is going on out there ? That this House has considered overpayments of carers allowance. I called for the debate because of cases that have started to emerge and reports that there are hundreds more, if not thousands. It was reported earlier this month that George Henderson from Preston, who is 58 and cares for his mentally ill son, who is also a heroin user, is being taken to court for an overpayment of carer’s allowance of £19,500. George was not aware of the earnings limit and claimed carer’s allowance for six years until a Department of Work and Pensions compliance check discovered that he had exceeded it. Not only was George taken to court earlier this summer, when he was told to pay back £106 a month out of his disability payment, but the DWP prosecuted him again earlier this month under the Proceeds of Crime Act 2002, seeking repayment of the full amount of overpaid carer’s allowance by Valentine’s day next year, forcing him to sell his house or face seven months in jail. His house is now up for sale, and he faces being unable to continue to care for his son, either because he will have to work more hours—if he can; if he gets the operation he needs—to be able to pay rent and afford a house, or because he will be in jail. The Guardian reported last month that DWP plans to go back over its records for the last eight years—the period since such a check was last done properly—will result in at least 10,000 cases of historical overpayment of carer’s allowance, with around 1,000 carers facing criminal prosecution. I ask the Minister, as I ask the House: is that the message that we want to go out to carers? There are 6.5 million unpaid carers in the UK—estimated to increase to 9 million by 2037—who save the economy an estimated £132 billion a year. The “better care, closer to home” model for the NHS and social care relies heavily on unpaid family or friends, in spite of more older people living alone. We therefore need to encourage more carers to come forward who are not necessarily the partner or even the child of the person they care for. I pay tribute to all unpaid carers. They are indispensable to the person they care for and vital to society. Less than half of carers work, and one in six has given up work at some point to fulfil their caring role. The benefits of their caring roles are well recognised, as are the benefits of work both to carers, in providing some respite from their caring role, boosting their self-esteem and providing them with more interaction with others, and to society, because helping carers into the labour market prevents their skills from being lost. Work also provides income, which is important, as 35% of carers are in poverty, which is 14 percentage points higher than adults overall. By caring for someone full time, a carer saves a local authority the cost of a care home place, which is about £750 a week in my area in Derbyshire, but much more in more expensive parts of the country. For that minimum of 35 hours of care a week, a carer can receive carer’s allowance of £64.60 a week—about £700 a week less than the cost of a local authority care home. It is also equivalent to, at most, £1.85 an hour, or £3,360 a year, so obviously many carers must work to make ends ​meet. The person they care for will be on disability benefits, which have not kept pace with the cost of living for people of low incomes, and they will have no way to increase their income. Most carers cannot work full time so they seek part-time work to fit around their caring duties. That is often necessarily low-paid shift work. A carer can earn a maximum of £120 a week while also claiming carer’s allowance, so their maximum income from both work and caring is £184 a week, or £9,600 a year. It is no wonder that carers are disproportionately poor. However, unlike almost every other benefit and despite the principle enshrined in universal credit, a carer earning just £1 over the £120 threshold ceases to be eligible for any of the £64.60 carer’s allowance. That cliff edge causes huge problems. When I worked for the Union of Shop, Distributive and Allied Workers, I saw people receiving a pay rise of just 1% or 2% unwittingly going over the earnings limit and being due to repay hundreds or sometimes more than £1,000 in carer’s allowance at the end of the year, causing huge hardship. Their being upset is understandable. If someone on carer’s allowance earns £120 a week, their total income will be £184.60, but if their pay goes up by just £1, their total income will be £54.60 a week less—just £121. With such a cliff edge, it is vital that carers are well aware of the earnings limit, but there is lots of evidence that they are not. Carers UK does a great job of supporting carers with an online forum on which carers report their problems. It told me of one carer who looks after someone who is severely disabled and who knew that they would earn more than the threshold for two months running. They dutifully contacted DWP to report their change in circumstances, but then received a notice of overpayment over the previous year, which came as a total shock and surprise. They had not realised that they were earning several pounds over the threshold. They are now paying back the overpaid allowance over 18 months while on a severely reduced income, putting them even more into poverty. For starters, it does not set out what the “certain expenses” are, and nowhere that I can find, other than in the regulations, does the Department—the Government—actually do that. The information on the gov.uk website is certainly very unclear, and even when people receive a compliance form to complete, they are simply asked, “What expenses do you incur?” They are given no guidance on what those expenses might be. Claimants are informing the Department for Work and Pensions of their work circumstances, but they are not informed in the letter that they need specifically to inform the Carer’s Allowance Unit. With the lack of information and the huge cliff edge, it is obviously imperative that the Department takes a responsible attitude to compliance checks for carer’s allowance—there are such huge losses for people if they are overpaid. When I worked at USDAW, we would see difficult cases, but for a maximum of a year. Now, we see cases lasting three or four years and racking up thousands of pounds in overpayments. I ask the Minister: why is that the case when real time information has given the DWP monthly earnings data since 2014? In 2014, the number of cases taken up dropped drastically. In 2011-12, there were more than 30,000 cases of overpayment of carer’s allowance, but in 2014, 2015 and 2016, that more than halved to just 14,500 cases, despite the Department having much more detailed, and electronic, information. Bearing it in mind that two ​thirds of cases of carer’s allowance overpayment involve earnings over the threshold, it seems like thousands of cases have been missed in the last few years, since the dramatic drop in 2012-13 when cuts were made to administrative staff in the DWP. Staff have been drafted in from the compliance unit in Ramsgate and from pensions offices in Motherwell and Ilford to deal with the backlogs, but those backlogs can now go back over several years, costing carers thousands of pounds. Carers are starting to come forward and, on the evidence seen so far, are being dealt with extremely harshly. A case reported a couple of weeks ago from Belfast was of a carer from whom a payment of more than £14,000 of carer’s allowance is being sought in full by 5 January or—again—they face a jail term. I have some questions for the Minister. Does he think that the information given to carers about the earnings threshold is clear enough to be fully understood and acted on by individuals who are in a very demanding role and combining that with paid work, while doing all the juggling that people have to do when they are on a very low income? Will the Minister please commit to looking at that information, both in the letters received by all carers and online, and making it clearer? Does he believe that the DWP has used all its ability to seek to ensure compliance with carer’s allowance earnings rules and to keep overpayments to a minimum? Does he think that, in the circumstances, it is proportionate to seek such huge sums from low-paid carers? One compliance officer working in the Carer’s Allowance Unit has calculated that more than 30% of recent overpayments were for amounts of earnings less than 20% over the threshold, so for less than £24 a week, people are being prosecuted for £64.60 a week going back over many years and thousands of pounds. Will the Minister please look again at the policy for these people who have been overpaid as he looks at the information for carers? Also, I hope that, with a new regime in the Department for Work and Pensions and a new Secretary of State, the Department will look again at the report from the Work and Pensions Committee on carer’s allowance and the cliff edge, and reconsider the possibility of a taper so that we cease to see huge overpayments, cliff edges and the impoverishment of carers, to whom we owe so much. It is a pleasure to serve under your chairmanship, Mr Betts. I thank the hon. Member for High Peak (Ruth George) for opening the debate. She displays a huge amount of knowledge, passion and care in this area, and she has raised many points that the Government and I would agree with. Carer’s allowance actually falls within the remit of my hon. Friend the Minister for Disabled People, Health and Work. There is an outstanding relationship with Carers UK, both at ministerial level and with among officials. There are regular meetings with Carers UK, and many of the points raised in this debate have been raised previously and are being looked at and reviewed, so the debate is very timely. As an individual, I share much of the passion that we have heard today. Not a lot gets me emotional, but I remember, in my early days as a constituency MP, ​meeting young carers, who are often forgotten in debates about carers. I am talking about children who have often lost the things that we all took for granted when growing up, as they have taken on caring responsibilities. It was a particularly moving meeting, and one that I have never forgotten, so I was happy to step in for this debate. The Government recognise and appreciate the vital contribution made by informal carers, who provide invaluable support for relatives, partners, friends and neighbours who may be ill, frail or disabled. We also recognise the important role that many carers’ organisations play across the country in supporting carers, including those in the hon. Lady’s constituency, such as the Blythe House and Buxton carers’ support groups, which I am sure that she, as a diligent constituency MP, will have had much involvement with. The Government are already supporting carers in a number of ways, including through the benefit system. About 850,000 people currently receive carer’s allowance. Since 2010, the rate of carer’s allowance has increased from £53.90 to £64.60 a week, with a further increase to £66.15 planned for April 2019, meaning an additional £635 a year for carers since 2010. By 2023-24, the Government forecast a spend of around £3.4 billion a year on carer’s allowance, which is a real-terms increase of more than one fifth since 2016-17. Carer’s allowance offers a measure of recognition of the vital contribution that carers make to our society, although we fully appreciate that many make substantial sacrifices to care for their loved ones. That is why in June 2018, the Government published “Carers action plan 2018 to 2020: supporting carers today”, which sets out a two-year programme of targeted work to support unpaid carers. The plan puts a focus on practical actions to support carers and gives visibility to the work already under way or planned within Government. However, I recognise that there are concerns about carer’s allowance, particularly around earnings and the possibility that a number of claimants may have been overpaid. Again, I pay tribute again to the hon. Lady, who raised some of those issues, which have been raised in the media, through the work of the Work and Pensions Committee and through her own recent, diligent parliamentary questions. It is in everyone’s interest that we deal with fraud and error effectively, preferably by stopping it happening in the first place. However, we are not complacent about fraud and error and already have a number of measures in place to deal with it. We are also reinforcing to carers their responsibility to inform us of changes to their earnings and other circumstances. Our priority has been to try to clear new carer’s allowance claims as quickly as possible, including during a period where the number of carer’s allowance claims has increased significantly. In part, that increase is due to the great work of stakeholders to raise the profile of carer’s allowance. We have also done our part by introducing the new online claim system, which is easier to use and—perhaps surprisingly for a Government online system—has a 90% satisfaction rate, so there are certainly some lessons for us to learn there. Our performance here has been consistently improving, partly as a result of recruiting new staff—an additional 150 in the last 12 months alone. Many of them are based in the Preston, Blackpool and Swansea offices. I know that the Minister for Disabled People, Health and Work visited the Preston office in the summer, in her role as the Minister responsible for carer’s allowance. She was very impressed with the enthusiasm and hard work of the staff. The Minister says that performance is improving. In what way is it improving? Does he mean that they are now going back over these historical overpayments and requesting them back from carers? Most carers and most people in this House would not see putting right the wrongs of previous years by finally investing in compliance to be a performance improvement, at least not for the carers that it affects. I am coming on to what those staff will be doing and the improvements that we are bringing forward. As well as focusing on new claims, we are working hard to reduce backlogs elsewhere in the system, remind carers of their responsibilities and make better use of available technology. The Department for Work and Pensions takes every care to explain a claimant’s responsibilities when they apply for carer’s allowance. This includes the need to report changes on time. Our annual notifications help remind claimants how important that is. We also provide information on the website gov.uk, while customers who need additional advice can contact the Carer’s Allowance Unit for further information, and we encourage stakeholder groups to help to share that information. I absolutely understand the points the hon. Lady made about whether the guidance is perfect. When the Work and Pensions Committee raised questions with the Minister, we recognised that there were improvements to be made in this area. We have already made significant changes to the website. I also accept the points made about the letter, which the hon. Lady went through. I will encourage the Minister for Disabled People, Health and Work to meet with her personally to discuss the specific points about the quality of that guidance and information. We absolutely have to get that right, and it was a fair point to raise. The consequences of not keeping the DWP up to date, including the need to repay overpayments, are clearly stated during the initial claim process and in our annual uprating letters. Therefore, every claimant has an obligation to tell us when their circumstances change. As with all benefits, the DWP has a responsibility to ​recover an overpayment where a claimant has failed to disclose a change that would affect their entitlement. Where there is an overpayment, the DWP will always look to recover the debt through a sustainable repayment plan. Where a claimant is having difficulty repaying a benefit overpayment, they can request a reconsideration of the amount that is being taken. It is also important to note that once a claimant has told us of a change of circumstances, they would not be responsible for overpayments from that date. However, we must recognise that we need to work with claimants to help them avoid overpayment and to ensure that we pay the correct amount. In recent years, the DWP has introduced new technology to make it easier to identify and prevent overpayments, with cases checked against earnings information held by Her Majesty’s Revenue and Customs. The new verify earnings and pensions—VEP—system, allows us better to check earnings declared by carers to the DWP against tax records, and it allows staff to quickly take any action to clear up any discrepancies. Where we do have arrears from previous exercises, our priority is to ensure that the benefit is being paid at the correct rate in order to provide regular financial support. Once we have done this, we can determine any overpayment that might have accrued. Even when there has been a delay in dealing with a change in circumstances, as a carer’s allowance claimant can earn £120 net of allowable expenses a week, many of these claimants will have been paid correctly anyway. We will be increasing the carer’s allowance earnings limit again from £120 to £123 a week from April 2019. The Office for Budget Responsibility forecasts that average earnings will increase by around 5.1% between 2017 and 2019, whereas we will have increased the carer’s allowance earnings limit by 6%. The Government acknowledge the vital role played by carers and the valuable work that carers’ organisations carry out on behalf of carers. We recognise that the UK’s 6 million carers play an indispensable role in looking after friends or family members who need support, which is why it is so important that carers should continue to have access to a dedicated benefit that recognises their particular contribution to society. Our staff work hard to support carers and pay people the right entitlement. I know that the Minister for Disabled People, Health and Work is very passionate about this, and it is a real priority for her. Equally, there are improvements in place that mean that we are tackling arrears and have a much smoother process for taking account of any earnings changes going forward. I thank the hon. Lady for giving me the chance to talk about carer’s allowance. Have to smile ... figures used by both politicos inaccurate and out of date ! Numbers attending said debate ? Unknown but I will do some digging ... odds on 20 or less ??? One more inportant thread to keep a close eye on ! Perhaps I should have been an Argus ... a mythical creature with hundred eyes ??? Oh , just a passing thought ... on what mandate from the carer army are CUK discussing OUR needs with the Government ??? Carers Rights Day ... another non Right ... the opportunity to elect officials to negotiate ... just like ordinary workers ??? If , and a big IF , the DWP are told to drop their purge ... just drawing a line and send out " Naughty , naughty " letters without further action , those who have played the system will escape scot-free ! 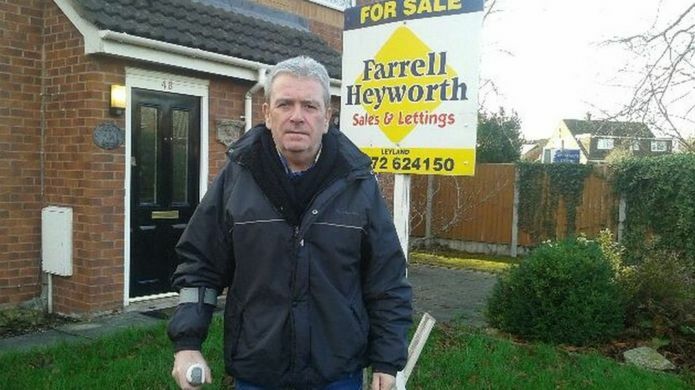 DWP forces carer to sell home or face jail to repay benefits. The DWP official explained that there would be no merit in doing so, because George gaining carer's allowance would mean John losing the severe disability premium. The amounts were roughly the same. However, George thought he could see a big advantage: it would help him manage his son's income so he could not spend it all on heroin. "I would be in control of some of John's money. I would give him that money back on a daily basis, not the drug dealer taking it off him every fortnight when he was standing at the cash machine," he said. What George did not realise - and the DWP official did not tell him - is that his work for a taxi firm, earning well over £120 a week, meant he was not entitled to carer's allowance. There are strict rules for claiming that benefit. Earning even 1p more than £120 a week means recipients lose the entire £64.60 weekly payment. ''Not once did he [the DWP official] mention anything about employment, about how much you could earn, nothing at all," George said. The disability benefit his son lost is now worth £64.30 a week, while the carer's allowance that George claimed is now worth £64.60 - a difference of an extra 30 pence a week.
" I don't owe a penny "
For more than six years, the Department for Work and Pensions failed to notice that George was paying tax on his earnings and had received £19,500 carer's allowance. But then it decided to prosecute him for fraud over a mistake that cost it just 30p a week. George pleaded not guilty. "As far as I was concerned, I never done anything wrong. I don't owe the DWP a penny. They took it off my son, gave it to me, who gave it back to my son as caring for him," he said. "So the money that came off my son is the same amount of money as the DWP are actually trying to take back off me." At his trial at Preston Crown Court in August, George was found guilty of fraud. He was fined, given a 32-week suspended sentence and electronically tagged. He began paying back the money in monthly instalments. Last month, the DWP used the Proceeds of Crime Act to force George to sell his home and pay back all £20,900 of overpaid carer's allowance plus fines by 14 February. He faces seven months in jail for failing to do so. George accepts that when applying for carer's allowance, he wrongly ticked the box that said he was unemployed. He can't remember why, but explains: "The only thing I can think is that I've ticked that box thinking the question is about my son. But it was a total mistake." George believes the DWP is to blame for not spotting the error more quickly. He is one of nearly 70,000 unpaid carers who the DWP is now pursuing for arrears of hundreds, thousands or even tens of thousands of pounds. 'If they're not checking and telling these people the rights and the wrongs, and then claiming x amount of money after a 7-year period, I think it's ludicrous. It's beyond a joke'. Frank Field, chair of the Work and Pensions Committee, has accused the DWP of "shocking ineptitude" and asked the National Audit Office to investigate urgently. "Such eye-wateringly large overpayments suggest that systemic failings or gross incompetence - or a combination of the two - are at play," he said. The DWP estimates it overpays £160m in carer's allowance a year and is now trying to claw back some of that money. "We have a duty to the taxpayer to recover outstanding money in all cases of fraud or error, but there are safeguards in place to ensure repayments take into account people's individual circumstances," a spokesperson said. George is about to have the first of two hip operations. But when he leaves hospital, he's worried he'll have nowhere to live: "Will I be homeless? Will I be in a hostel? I've really no idea." The first " Real " news following the DWP announcement. Two issues ... carer claiming " He didn't know " ... and the use of monies passing between the caree and the carer. Enough from me ... I suspect CUK will release a press statement shortly ... and I will consider more once we all know their view ! Somewhat sympathetic but ... the real action ... comments section ... silent as a type ? That , in itself , is unusual ... ? One more newbie seeking help ... hopefully , the mods will transfer that thread across to this one. Still little news ANYWHERE ... even CUK / Carers Trust are taking a back seat on this one ... not even a toe in the water beyond CUK issuing a carefully worded press release ... as is the norm nowadays ... a case of what you are allowed to say rather than what you want to say ? No further involvement on this thread ... nothing from the advice team ... would help us even though this issue does not concern them first hand. Perhaps wise ... although will not be good for their public relations nor inspire confidence in any of us. In that respect , 2018 will be remembered as one of the blackest years in CUK's history. THERE AGAIN , JUST HOW LONG AS THE EARNINGS " PROBLEM " BEEN ON THE STATUTE BOOK ... A FEW DECADES ??? General impression of those affected being left swinging in the wind for whatever excuse offered in mitigation. Continuing to monitor news nationwide ... perhaps now considered " Old " news as far as the media is concerned ? Published Monday, November 26, 2018. This House of Commons landing page briefing has been prepared in advance of a debate entitled "Overpayments of carer's allowance". This will be led by Ruth George MP and will take place in Westminster Hall on Tuesday 27th November, starting at 11am and lasting for 30 minutes. Carer’s Allowance is a non-contributory, non-means-tested benefit paid to people who care full-time for someone who is severely disabled. It is an “income replacement” benefit, intended to provide a measure of income-maintenance for people unable to do full-time paid work because of their caring responsibilities. It is not a payment for care provided or a “carer’s wage”. It is currently worth £64.60 a week. At February 2018 there were over 840,000 recipients of Carer's Allowance in Great Britain. To be entitled to Carer’s Allowance, a person must be providing at least 35 hours of care a week for someone in receipt of a qualifying disability benefit, not be in full-time education (21 hours or more a week), and, if in paid work, have earnings after certain deductions of no more than £120 a week after certain deductions. the middle or highest rate Disability Living Allowance care component. Personal Independence Payment daily living component (either rate). Constant Attendance Allowance at or above the normal maximum rate with Industrial Injuries Disablement Benefit, or at the basic (full day) rate with a War Disablement Pension. The earnings limit has been increased substantially in recent years, but carers’ organisations still argue that the rules make it difficult for carers to combine paid work with their caring responsibilities. A person loses entitlement to Carer’s Allowance completely as soon as their earnings exceed the threshold – the “cliff edge” problem. Further information can be obtained in the Commons Library briefing paper SN00846, Carer’s Allowance, 19 July 2018. Carers UK’s factsheet, Carer’s Allowance 2018/19. Disability Rights UK Factsheet F30, Carer’s Allowance. On 7 October 2018, The Guardian reported that “more than a thousand carers face being prosecuted for fraud” and that another “10,000 carers could face fines” owing to moves by the Department of Work and Pension to recoup money reportedly paid incorrectly over several years (“UK carers face fines and fraud charges because of overpaid benefit: Campaigners say DWP’s move to recoup money paid out is ‘not welfare priority’”). The Guardian report stated that overpayment cases involved people who had received more Carer’s Allowance than they were entitled to owing to a change in their earnings so that they started to earn more than £120 a week, or because they had enrolled as a student in full-time education, often without realising that this affected their entitlement. It reported that in some cases people have received £10,000 more than they were entitled to. At Carers UK, we hear from carers who are told that they have been overpaid Carer’s Allowance. This can happen when carers did not realise the rules in relation to earnings, studying or other rules. This can be hugely stressful, particularly for those providing significant care or who are juggling responsibilities, or who are on low incomes and are finding it hard to manage financially. Our most recent survey found that over a third of carers (37%) were struggling to make ends meet. When that overpayment goes back several years, this can become extremely difficult or even impossible for the carer to repay. The Department for Work and Pensions should be pointing these areas out earlier to carers to stop this from happening, and acting on overpayments more quickly. This would make life easier for everyone, and it would reduce the number of carers whose overpayments go back years. We need to make it easier for Carer’s Allowance claimants to report changes so that this can be done more quickly. Unlike Universal Credit, Carer’s Allowance claimants cannot manage their details or account online and we think this should change. This would make it easier for carers to upload supporting documents and notify changes to the DWP quickly and efficiently. We think this would help the DWP to update carers in receipt of Carer’s Allowance much more easily, with reminders on what to do if their earnings change, or they start studying, for example. We think that this would be better for everyone and we have proposed this to the Department for Work and Pensions. Those without online access would still be able to use the telephone or write in, as Carer’s Allowance recipients largely have to do now to make changes happen. No-one wants a situation where carers who are earning and caring are concerned about whether their benefits will be affected. We want to ensure that carers are clear about the entitlements and rules and are able to report changes quickly and easily, and stay in touch with the labour market where they are able to do so. To ask the Secretary of State for Work and Pensions, how many cases of recovered overpayments of carers allowance due to earnings in excess of the threshold related to earnings which exceeded the threshold by (a) less than 10 per cent and (b) less than 20 per cent in each of the last 10 years. The Department for Work and Pensions (DWP) recognises and appreciates the vital contribution made by informal carers who provide invaluable support for relatives, partners, friends and neighbours who may be ill, frail or disabled. We also recognise and value the work that carer’s organisations undertake for and on behalf of carers. Since 2010 the rate of Carer’s Allowance has increased from £53.90 to £64.60 a week, meaning an additional £550 a year for carers. By 2022/23 we are forecast to spend around £3.7 billion a year on CA, a real terms increase of more than a third since 2016/17. DWP has a duty to protect public funds and an obligation to ensure that, overpaid benefit payments are recovered in accordance with the appropriate social security legislation. In September 2018 DWP introduced the Verify Earnings and Pensions (VEP) system for use in Carers Allowance. The VEP service presents earnings and employment data to users, with an automated alerts service generating notifications of earnings or pensions related changes. This allows benefit awards to be updated far more quickly. Where there are discrepancies DWP will contact the claimant for further information. This activity is part of the normal claims handling and maintenance process. Data is only available from 2011/12. Table 1 below shows the volume and value of CA new debt overpayments deemed recoverable for the period available up to 2017/18. Table 2 shows the monetary value of CA overpayment recoveries in each year. Please note, recoveries in a financial year won’t necessarily correspond to the new debts raised within that year. DWP has different deduction rates to be applied in different circumstances and these rates can vary dependent upon a claimant’s particular circumstances. Because of this it would not be possible to provide a meaningful average recovery amount. The Government keeps the CA earnings limit under regular review. In April 2018, the CA earnings limit increased from £116 to £120 a week. This 3.4% increase was higher than average earnings growth (Sep 17). In the Economic and fiscal outlook (March 2017) the OBR forecast that average earnings would increase by around 7.5% between 2015 and 2018, whereas we will have increased the CA earnings limit by around 9%. To ask the Secretary of State for Work and Pensions, how many of the prosecutions relating to overpaid carer's allowance related to (a) 35 hours of care per week not being carried out, (b) earnings in excess of the threshold and (c) carers taking up an education course exceeding 21 hours of study time in each of the last 10 years. The Department for Work and Pensions (DWP) has a duty to protect public funds and an obligation to ensure that, overpaid benefit payments are recovered in accordance with the appropriate social security legislation. DWP does not routinely publish prosecution statistics. The information is not available at a granular level. The level of detail requested could be provided only at disproportionate cost. To ask the Secretary of State for Work and Pensions, how many prosecutions of carers for overpayments due to earning restrictions has his Department sought in each year since 2008. The Counter Fraud & Compliance Directorate (CFCD), part of the Department for Work and Pensions (DWP) is responsible for the prevention, detection and, where appropriate, investigation of fraud and error against all benefits administered by and on behalf of DWP. DWP does not routinely publish prosecution statistics and the specific information requested is not available at a granular level. This could only be obtained at disproportionate cost. The Committee Chair, Frank Field MP, has written to the DWP to seek further clarification on the number of cases in which overpayment is being pursued as well as how many will result in prosecution, in addition to further information. The DWP estimates that it overpays £160 million in Carer’s Allowance on an annual basis and is now looking to recover that money. This means that many carers could have to repay up to thousands of pounds, or face more serious action; 1,000 carers could face prosecution and up to 10,000 may face fines. The Committee has decided to investigate and launched an online survey to gather the experience of claimants’ who have been contacted by the Department about overpayments. There are 6.5 million unpaid carers in the UK who make a hugely valuable contribution to society. Many carers will be entitled to Carer’s Allowance, but this Committee has previously reported on the “cliff edge” within this benefit; if someone earns just £1 over the earnings threshold, they lose 100% of their Carer’s Allowance. It has been reported that many carers are often not aware that a rise in their earnings has taken them over this threshold. This means that they could, inadvertently, continue to receive Carer’s Allowance when they are no longer eligible, resulting in an overpayment. Our health and social care systems would fall apart without the contribution of unpaid carers, who perform a selfless and invaluable role for at least 35 hours a week to qualify for the £64.80 carer’s allowance – that’s a maximum £1.85 an hour. When I worked with retail staff, we would often see someone get a small pay rise and inadvertently exceed the earnings threshold. It was bad enough when this was picked up at the end of the year and they had to find and pay back hundreds of pounds. When carers are only being informed of overpayments years later and potentially being taken to court for thousands of pounds, it is imperative for the Committee to look at the evidence and question whether Government is acting in the best interests not just of individuals, but of society and the wider economy. There you have it folks , all out there so far now published on this thread. Bleat all you like ... only by a challenge in a Court of Law MAY change the rules IF the Government continue to say " No ! " Unlike CUK , I try to keep all readers FULLY informed. Also the Work and Pensions Select Committee interview Amber Rudd tomorrow at 9.30am, hearIng is being shown live on the Parliament Channel. They will surely ask her about this. Carer’s Allowance is a benefit paid by the Department for Work and Pensions to carers who meet eligibility criteria. At an estimated rate of 5.5% it has one of the highest rates of fraud and error of all benefits administered by the Department. The Work & Pensions Committee published correspondence in November 2018 from Peter Schofield, Permanent Secretary at the DWP, revealing that some carers have accrued nearly £50,000 in overpayments of the benefit over many years and showing that the average overpayment this year to date is at a five-year high of £1,427. The NAO is undertaking an investigation into DWP’s administration of Carer’s Allowance which will set out the facts about how the benefit works and the Department’s measurement of the fraud and error rate. The NAO will also look at the Department’s approach to compliance and how it seeks to recover overpayments from carers. Don't hold your breathe ! Wrap on the knuckles at best. Taper over the limit ... or even an increase ? Once completed , ideal time to look at the whole picture. There again , Brexit ... and it's the survival of the fittest ... all the lifeboats already long departed.